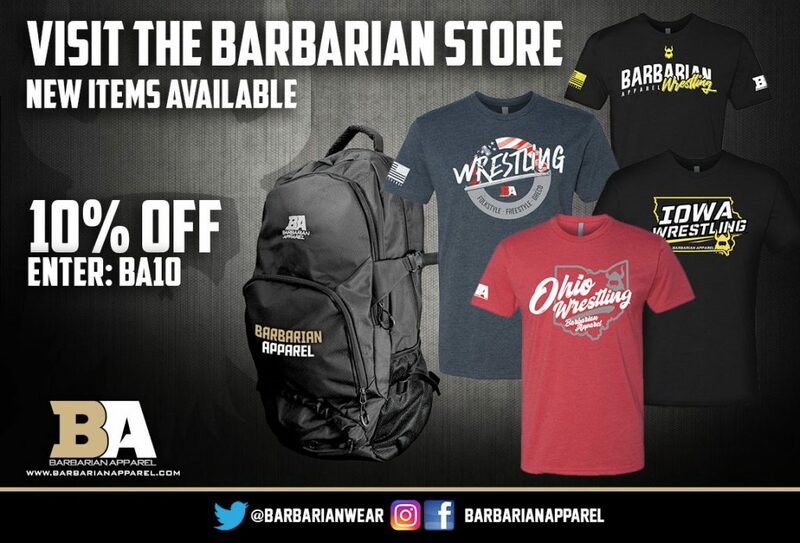 Greco-Roman takes centerstage at the World Championships beginning next Thursday in Budapest, Hungary. The two lightest weight classes, 55 and 60 kilograms, are crammed with young faces looking to take out their older counterparts (though a few of those guys aren’t exactly youngsters themselves). 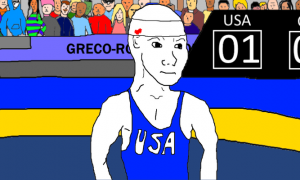 This latest generation of emboldened, technically-advanced Greco athletes demonstrates little tolerance for the wait-it-out machinations of the sport which have led to its fall from grace. If they get their way, these very same warriors are the ones who will be credited for virtually saving Greco from itself. 63 and 67 kilograms are very similar to the lightest weight classes in terms of potential excitement. The main differences, however, are significant. For starters, both weights featured here offer a collective pedigree that is immensely impressive. 63 kilograms boasts two Rio Olympic bronze medalists and 67 offers two Olympic champions. In addition, there are over a dozen combined Senior World medals between the two weight classes. There is also a little more refinement in these weight classes than you might find elsewhere. The skills are similar, but the execution tends to be crisper and more polished. You get the best of everything with 63 and 67, which is great news if you’re someone who enjoys highlight reels. This article makes references to United World Wrestling’s “Ranking Series” — for a brief description please see the first preview covering 55-60 kilograms. For a detailed overview, hop over to here. Friday, October 26th — Qualification rounds through semifinals. Saturday, October 27th — Repechage rounds through medal matches. Mohamed won the African Championships — not a huge deal — but finished second at the Hungarian Grand Prix — kind of a big deal — and so you can point to his as a case of benefitting from the “Ranking Series” system. When you think of a #1 guy, Mohamed might not come to mind first. However, in a weight class that might be more wide open than any other in Budapest, you also shouldn’t feel inclined to argue about it. Mohamed is solid. He’ll do the heavy lifting in his matches but can be vulnerable at times to explosive types. His length has proven to be an issue for some, particularly if he gets a lock from top. You break the lock and bide your time, and he’s a solvable puzzle. You’d be hard pressed to find a wrestler who has put in a stronger year than Mihut — and he dropped down this season, experiencing success pretty much everywhere he went despite also having to endure same-day weigh-ins. The Worlds will be Mihut’s 11th event of the calendar year 2018. He won seven tournaments, including the European Championships, and placed second to Nikolai Vichev (BUL, world no. 8) at Petrov. 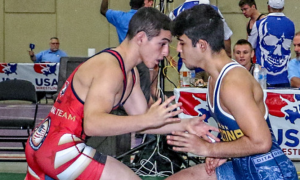 Two tournaments were washouts — Vehbi Emre and Pytlasinski — but those events saw the Romanian compete at his old weight of 67 kilos. It’s the Hungarian Grand Prix that cost him in the points race thanks to a quarterfinal loss at the hands of ’17 World silver Mirembek Ainagulov, who won’t even be in Budapest. Here is where it all devolves into chaos. Mohamed and Mihut are, at best, the tip of the proverbial iceberg. Russia is sending 2017 World bronze Stepan Maryanyan, who boasts the most complete skill-set out of everyone here. Period. Maryanyan does not make dopey mistakes. He just doesn’t. Every point against him (not counting phantom passives and so forth) is earned. Maryanyan also sports a wicked arm throw that he sets up from the other side of the body and can level change off of grinding tie-ups. His par terre work is, as you might suspect, outstanding, as well. That isn’t to say he is unbeatable — oh, he absolutely is. Maryanyan fades and can be goaded into frustration. But it’s a rare occurrence. Athletes who have been successful against him recently got their hands raised by putting him on his heels and defending from bottom. 2016 Olympic bronze Stig-Andre Berge (NOR, world no. 5) is now 35 years of age but it’s a good idea to forget about that for now. There’s something to be said for experience and Berge has tons of it — three Olympic Teams and 11 World Championships appearances (plus a bronze in ’14). Berge won Finland’s Herman Kare tournament in January, not a crazy-deep event. But he persevered at the Euros with two tough wins (and a very watchable tech over Poland’s Dawin Ersetic) before falling to Mihut by a point in the finals. Berge’s European Championships silver medal performance matched his best finish from the event — he was also a runner-up way back in 2007. Donior Islamov (MDA, world no. 7) is a loosey-goosey kind of athlete who represents a difficult test for most here. Berge decisioned him in May but Islamov battled back for bronze. His competitive docket has been sparse a little bit, but he’s seasoned enough to find a way to advance. Mossein Hajipour (IRI, world no. 17) doesn’t take a backseat to very many. Although he’s now 30, Hajipour wrestles like a sprite. Flowing attacks blended together with cutthroat in-fighting along with beautiful lifts make him one of the more pleasing guys to watch. Taleh Mammadov (AZE, world no. 18) won Vehbi Emre, which got him his (Ranking Series) points. He closed out with a gold at Karavaev. 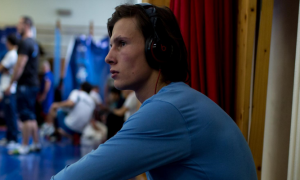 A member of Hungary’s next generation, Krisztian Vancza, recently took third at the Junior Worlds. But before that, he snared a bronze at his home country’s Grand Prix. Vancza does not appear completely ready for a giant step up in Budapest, but the fact that the tournament is in Budapest likely won’t hurt his chances, either. Elmurat Tasmuradov (UZB, world no. 10), he of the three bronze medals (two World, one Olympic) is back in a weight class that makes sense. No longer able to comfortably make 59 kilograms in 2017, Tasmuradov moved up to 66 and found limited success. 63 fits him like a glove. This season, the uber-talented 26-year-old looked very much in command securing his fourth Asian Championships gold, and it’s a safe bet that’s the version everyone sees a week from now. 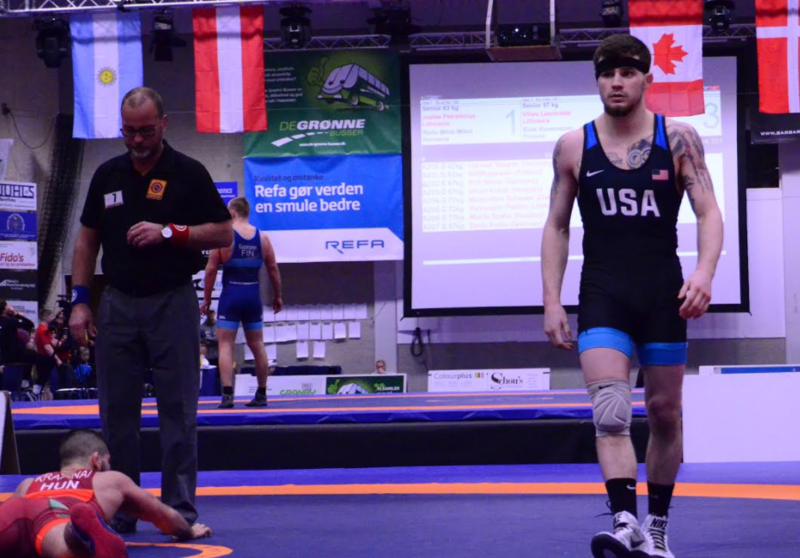 Team USA — Jesse Thielke (NYAC/LOG) At the German Grand Prix in August, Thielke scored two against Berge on a duck-re-duck that the Norwegian had zero hopes of defending. Unfortunately for Thielke, few offensive opportunities were either created or available after that and Berge took advantage of a second-period passive call and front-headlocked Thielke for a 3-2 decision win. Why is that important? Because Thielke should/could have been six points ahead of him. That’s not a slight on Berge. Or Thielke. Or ignorance of the fact that the German Grand Prix was labeled as a “warm-up” tournament. But if we’re talking skill, ability, and dynamics, Thielke has more to offer than someone like Berge, hence why you would have liked to see him pile it on. There is not — and mark this down — another wrestler in this weight class who can do what Thielke does. It’s not the duck-under-to-bodylock attacks. That’s not an uncommon technique. The difference is that Thielke approaches Greco-Roman offense with the chain-together mindset you see most often from collegians. He sees connections and opportunities most miss out on, and his penchant for countering attacks and turning them into points is yet one more area where he shines above the field. For a recent international reference, think back to Thielke’s close loss to Mihut in the Thor Masters finals. Mihut scored on a correct-throw-arm-throw and a headlock; and then Thielke floated over to reverse and nailed back-to-back gutwrenches. He’s just programmed to score, score, score when he’s on his game. How about Islamov? It was the Moldovan who stood between Thielke and a berth in the Rio Olympics. One of the most important US victories over the past few years. Islamov led for a minute there, a couple of arm throws. Thielke made him pay by aggressively out-techniquing him, an important point to make since Americans are usually overmatched when it comes to actual, you know, technique. Not Thielke, certainly not on his feet. No one here is better. The area Thielke has to worry about is cliché — par terre bottom (or defense). But that leads to the other area holding the second-most importance — engagement. Thielke’s is an approach that lacks the mindless clashing officials mistake for offensive posturing. So, passivity is a real danger. He is going to get knocked. But an energized, motivated, and dare say ferocious version of Thielke is a nightmare match-up for all of the heavies in this bracket. He is on their level. He has already proven it before. So long as Thielke himself understands all that, he is without a doubt one of American Greco-Roman’s most legitimate medal candidates. Borrero is a very for-real #1 in the sense that he could win this thing and it wouldn’t come as even the slightest surprise — though he only has the top spot because Kazakhstan isn’t sending Almat Kebispayev. Even still, that’s really saying something considering Borrero won the Worlds and Olympics at 59 kilos. But instead of testing the waters at the non-Olympic 63, he immediately opted for 67 in 2018. The Takhti Cup in January, his first international outing following Rio, saw the respectable Fevzi Mamutov (UKR) catch the Cuban on his back in the second period for a surprising fall. Borrero then lost a close one to Mohammad Elyasi (IRI) going for third. 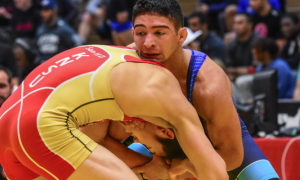 The rest of the season has gone according to script, with Borrero earning golds at every event following Takhti, including his home country’s Granma Cup in February, and the Pan Ams in Peru this past April. Shimoyamada…an unconventional #2 who moved up to the second slot because of the system in place. Not that Shimoyamada didn’t earn his points. He silvered at the Asian Championships and grabbed fifth at Vehbi Emre. He is also a very well-rounded athlete with eager offense, which US fans caught a nice closeup of at the Dave Schultz Memorial last November. Shimoyamada is relentless in the tie-ups, he pummels well battling into position. But given the rest of this field, he is seen mostly as a sleeper. Murat Firat (TUR, world no. 4) is not an overwhelmingly experienced competitor compared to many of the headline-grabbing names in this weight class, but he’s a threat nonetheless. Ignore his record over the past couple of seasons, relying on results alone leads to illogical mental gymnastics when talking about a wrestler like Firat. At only 21, he is still budding and Budapest might not welcome in his ascension. But — and this is recognizing Turkey’s depth at 67 with Enes Basar, among others — Firat has the chance to become special. He is rough around the edges, gets caught reaching, is often goaded into sloppy exchanges. Thing is, Firat knows how to stay patient yet aggressive, and he explodes on lifts and turns. That’s the game. One Olympic champ in a weight class is good, two is even better. Borrero’s fellow Rio champ, and former World gold himself, Davor Stefanek (SRB), is purportedly going 67 in Budapest, injecting more cache into bracket. He caught a serious beating from two-time World bronze Artem Surkov (RUS, world no. 4) in the Euro finals last year and then healed up some nagging injuries before returning for the Mediterranean Games (at 77 kilos) back in June. A Borrero/Stefanek showdown would make for thrilling theater, but it’s probably unlikely that match comes to fruition due to the minefield that will most assuredly exist elsewhere in the bracket. And that begins with Surkov, the angriest, most artistic scorer in this weight class, if not the entire tournament. It took a frenetic, gutsy semifinal effort from eventual champ Ryu Han-Soo (KOR) to keep Surkov back in Paris last year. Forced par terre wasn’t in the mix in 2017, it is now, which skews mightily in Surkov’s favor. Ryu will be in Budapest, too. He will surely bring problems for those who fail to keep up with his pace or get lulled into thinking they’re safe with an overhook. That’s one of Ryu’s gifts — he goes hard, hard, hard, but can also dial it back and set traps that lead to big scores. A tremendous athlete. 2016 Olympic bronze Shmagi Bolkvadze (GEO, world no. 7) reigned supreme at the inaugural U23 Worlds last year and put himself in solid position this season with his silver at the European Championships. But the reason for that silver was Surkov, who blew the doors off Bolkvadze with frightening efficiency. 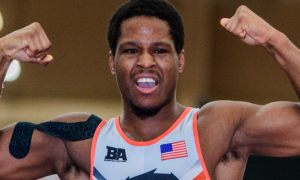 Team USA — Ellis Coleman (Army/WCAP) 2017 was going to be “the year” for Coleman. Those two Junior World bronze medals…the 2012 London Olympics…the ’13 Worlds…the seasons ruined by injuries, surgeries…the move to WCAP…the talent, the frustration… It was as if the volatile rollercoaster that encapsulated Coleman’s career throughout his first five full Senior seasons was specifically meant to mentally prepare him for an enormous breakout in Paris. Most in the US are now familiar with the end to Coleman’s 2016-17 campaign. His body, practically unbeknownst to him, was being victimized by a relatively-obscure autoimmune disorder that wreaked havoc during periods of physical exertion (aka, his profession). He coasted through his first bout in Paris, that’s true. And he seemed okay flinging around in the early-goings opposite Mate Nemes (SRB), although a quick caution put him in a hole. But he was done, anyway. Done. For even if Coleman had won that match, chances are decent that his physical would have been on the brink of a complete shutdown later on in the day (which did actually happen at the Military Worlds). It took Coleman, now 27, about five months to recover. Doctors, medical people — whomever — identified his issue, and provided him with medicine and various instructions. 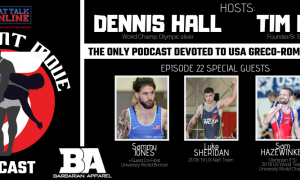 By early 2018, he was up and running again, blitzing through the Armed Forces Championships and taking a trip to Bulgaria for the Petrov training camp. That’s where the “Ninja Squad” was born. The Ninja Squad, comprised of Army’s elite lightweights, made a pact in Bulgaria, that from then on, they would go after each other in practice without any hints of mercy. To push the envelope offensively, to fight it out at all costs. Extra work. 100% intensity at all times. 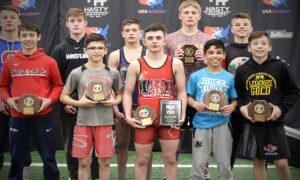 They were re-energized, and so was Coleman, who ran the table at the US Open outscoring the opposition in five matches 47-0. 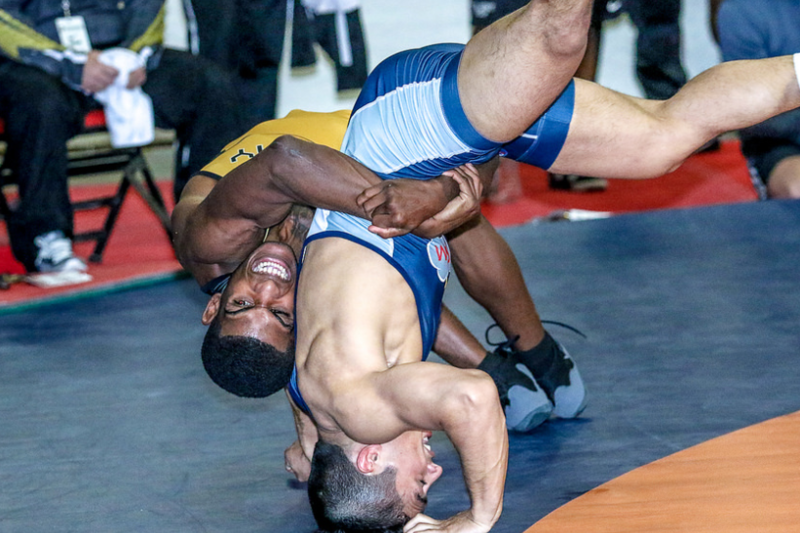 Next came the World Team Trials best-of-three finals series with Alex Sancho. Sancho took the first bout 6-3. And that was it. Coleman wrapped up Matches 1 and 2 via tech, sealing his second consecutive spot on a US World Team and his third overall. Once highly-regarded for his displays of the spectacular and the innovative “Flying Squirrel”, Coleman at this stage of his career is a different type of athlete. For a while there, he adopted a grinding approach that was intended much more to sustain (and break) position. The otherworldly offensive attacks for which he originally became recognized rarely made appearances. He has now reached a middle ground. Coleman is steadfast in his brutish pummeling skills and understands that his position is difficult to compromise, if only because he is almost always the superior athlete on the mat. But he also understands that the only way Americans can win on the World level is by doggedly force-feeding creative, dynamic attacks foreigners can’t keep up with. There is a difference between being one of the best in the World, which Coleman is, and earning a World or Olympic medal, which Coleman hasn’t. As he begins to shake hands with the concept that there are more competitive days in back of him than in front, he is realizing that it is time to play for keeps. Coleman will tell you all about it. The hardware is important to him. Coleman’s vulnerabilities are fewer than perhaps anyone else’s on the US squad. His is the most well-balanced arsenal and his defensive skills are underrated. But he is also in one of the deepest weight classes of the tournament and will be called upon to slay a giant right out of the gate. His only recourse? Accept that he’s a giant himself and act accordingly.